inSpirit: UUA Bookstore and Gift Shop: "You Can't Fire the Bad Ones!" "You Can't Fire the Bad Ones!" Three distinguished educators, scholars, and activists flip the script on many enduring and popular myths about teachers, teachers’ unions, and education that permeate our culture. By unpacking these myths, and underscoring the necessity of strong and vital public schools as a common good, this "must-read" (Gloria Ladson-Billings) challenge readers—whether parents, community members, policymakers, union activists, or educators themselves—to rethink their assumptions. 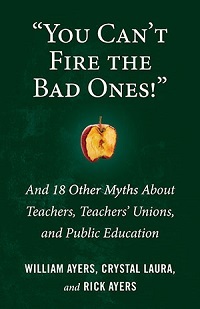 Myths covered include “Teachers’ Unions Are the Biggest Obstacle to Improving Education Today,” “Good Teaching Is Entirely Color-Blind,” “Teacher Activists Are Troublemakers,” “Too Many Bad Teachers Have Created a Public School System That Is Utterly Broken,” and 14 more. Will Standards Save Public Education?